Bit of a duh moment after finally finding a solution to this. What I needed was a way to print a single frame out of a Flash project. Pretty easy to print the first frame, or all frames, but I just missed the simple step to print a single frame. First, go to File -> Page Setup and select All Frames and Actual Size from the dropdowns under Layout. 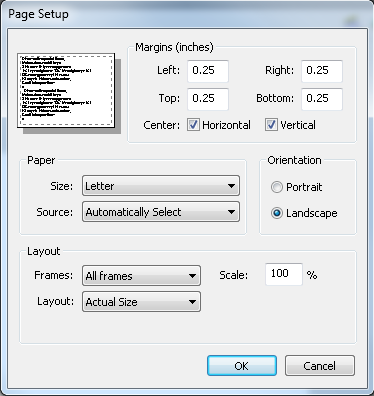 Click Ok and then go to File -> Print and select the page range you want to print. In this case only frame 35 will print. Click print and it’ll print just the frame you want.